Wisconsin&apos;s new head of PublicInstruction expects some difficult times in the near future for schools acrossthe state. 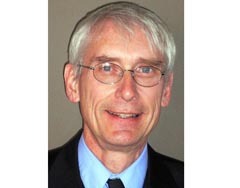 State Superintendent Tony Evers wasofficially sworn-in to the office Monday in Milwaukee. He takes over apublic school system that&apos;s facing many financial problems, which he says hasvery few areas left from which to make cuts. Evers says federal dollars will help maintainthe quality of education in Wisconsin, but he&apos;s not expecting any majoradvances in the coming years. Unless more federal money is given out, he&apos;spredicting some turbulent financial times. However, Evers says he thinksschool administrators and teachers can make it through. With little additional funding coming in,Evers says it does provides an excellent opportunity to re-examine how schoolsare funded. He says the state needs to help give districts more flexibilityunder revenue caps, while also finding a way to protect taxpayers. Eventhough school funding issues will be a top priority, Evers says he&apos;d also liketo focus on issues such as lifting graduation rates and looking for ways toimprove Milwaukee Public Schools.